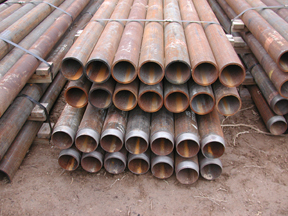 The use of mill secondary casing material for micropile construction is an important factor in the overall economy of the use of micropiles in the United States. Mill secondary casing material meets all strength and durability requirements needed for satisfactory micropile performance providing that adequate coupon sampling is performed to verify casing strength and ductility. In fact, there is no benefit to using prime casing as opposed to mill secondary material in terms of micropile performance. Despite the lack of additional benefit, the cost of prime casing is generally two or more times that of mill secondary casing resulting in much higher overall micropile cost if prime casing is specified by the owner. The use of mill secondary material as micropile casing has been recognized as the industry standard for many years and is provided for in all industry standard micropile specifications. However, many project specifications include requirements to provide prime casing with mill certifications as opposed to mill secondary material will coupon tests for micropile casing resulting in excessive additional cost with no apparent benefit to the owner. The additional cost of prime casing is significant and results in an unnecessary waste of the owner’s resources. The DFI / ADSC Micropile Committee has formed a Task Force to author a position paper on this subject. The goal of this position paper is to educate contractors, specifiers and owners on the proper use of mill secondary material for micropile casing so that satisfactory performance will be achieved and an economical end product will be provided. The issue of traceability for purposes of verifying that material is domestic for compliance with Buy America provisions will also be discussed. There has been a lot of interest recently for Load and Resistance Factor Design (LRFD) guidance for Micropiles. The American Society of Civil Engineers (ASCE) is offering a webinar entitled Load and Resistance Factor Design (LRFD) for Geotechnical Engineering Features: Micro Pile Foundations. Information on the webinar can be obtained here. LRFD Methodology for this webinar is based on the approach used in the AASHTO LRFD Bridge Design Specifications which is probably the most extensive LRFD Specification applicable to geotechnical and foundation applications in existence today. I attended the first presentation of this webinar and found it to be helpful in understanding LRFD concepts as they relate specifically to micropiles within the framework of AASHTO LRFD Methodology. The presenter for the pilot presentation of the webinar was Jerry DiMaggio. Jerry has been an instrumental figure in the implementation of LRFD methodology to foundation applications for FHWA and AASHTO and is extremely knowledgeable on the topic. The ASCE website lists the date for the next webinar as March 3, 2011. Also of interest in terms of LRFD for Micropiles will be the upcoming DFI / ADSC Micropile Seminar in Little Rock, AR on May 3-4, 2011. I will be giving a presentation on LRFD Design of Micropiles on Day 2 of the Seminar. Be sure to check the DFI website for more information and I hope to see you in Little Rock!